You must have heard stories of people falling in love with the boy/girl next door. You know - he was there all along but she just didn't notice how attractive he was until... Well I've just had a stamping moment like that! I was looking for something to inspire me for this week's Clean and Simple FTL sketch (see right) and my new Seeing Stars set was sitting on my desk and we looked at each other and suddenly I realised it was The One! Seeing Stars and I are going to be spending a lot of time together from now on! I am a huge fan of one-layer cards as they are easy to mail and can be very classy-looking. I'm also an enormous fan of this wonderful stamp set - it's one of those amazing sets that is perfect for anybody on almost any occasion. In fact, it's quite hard to think of something it wouldn't work for! Yay! It's the return of the bag-a-lope! Now, who couldn't you give this set to? Answers on a postcard please...! Cut a piece of Whisper White card stock 9cm x 18cm (3 1/2" x 7"), score and cold in half to make a card blank. 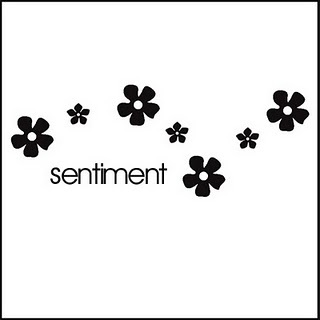 Stamp a sentiment, then stamp a design above and to the sides of it. Fabulously fast! Cut the sticky top off a C5 envelope. Score 2cm (3/4") in from each edge except the open one and crease the score lines with a bone folder. Cut an oval through both layers at the top of your bag with the large oval punch. Once you've filled your bag (mine contains a box of brads and a spool of ribbon) you can close it with ribbon if you like. We had the most wonderful, relaxing weekend away with my brother-in-law and his family. It was lovely to catch up with him and his lovely wife while the cousins romped about like puppies - and it was carnival weekend where they live so we also had an bonus outdoors evening of fun! I'll be back tomorrow with a musical offering. Intrigued? See you then! I love this! The colors and the cas style! Oh Super Vicky. Love the colours, the designs, everything! Hi Vicky - what a great card - and so versatile. I like the bag too. I really love this card and matching gift bag. I love all things stars and this is so CASE-worthy! Your card and matching gift bag are fabulous! I love those stars and they use that FTL perfectly. I can see so many different colour combinations, too! What a fun and fantastic use of the stars for both the sketch card and the gift bag. Your card and matching gift bag are just fabulous! I am a lover of matching things and this hits the spot for me!! Great job on last week's FTL sketch. Love the way you used the stars -- and how you made a matching bag. Such a good idea. I really should adopt that habit.